Well, dynamic memory is one of the features available in Windows Server 2008 r2 SP1. I do hope that you have tested dynamic memory. Let have a look on Dynamic memory Enhancement which available in Hyper-V Vnext (Code name that I give for new version of Hyper-V in Windows Developer Preview). Note:- Subject to change and feature is available during my testing using Windows Developer Preview Edition. 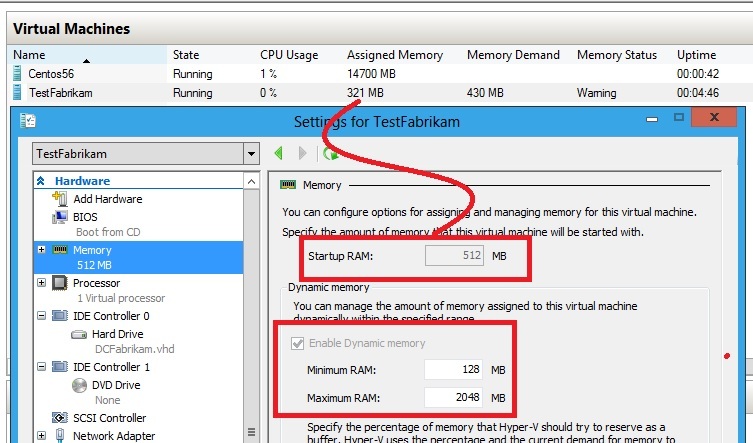 Enhancement #1:- Dynamic memory options is available when create a new Virtual Machine. Previously, you can only configure static memory when provision Virtual machine. Enhancement #2:- Dynamic Changing of Memory when Run Time. That's mean you no longer need to shutdown the Virtual Machine when you want to configure Min and Maximum Memory. You can change the amount of memory when VM is up and running. Find it quite useful especially the Vm has hit to Maximum memory and i can easily increase the amount of memory. Enhancement #3:- Ability to configure Minimum Memory. b) maximum memory - amount of memory that VM can use. c) minimum memory - minimum of memory that VM can shrink. This is quite useful for increase the ratio of VM that we want to host. We often saw the memory demand is less but due to Microsoft support policy on certain amount of minimum memory to start up memory, then we need to follow to the policy to avoid any issue. Therefore, we assign the exact startup memory. However VM detected VM does not require that much of memory. So you can consider it is a waste. With minimum memory, we can use the memory as mentioned in the start up and able to shrink until minimum memory when require. This concept is use balloon technique. From Assigned Memory column, it has shown 321MB rather than 512MB. For Maximum memory, do i allow to memory over-commit? Well, the answer is "No". So please do not configure more than what is available on your physical Hyper-V Server.